Online ticket sales for 2019 are ready to purchase! $20.00 early bird savings - save $5 off the admission price at the gate. To proceed, click on the link and it will direct you to our Eventsprout webpage. Thank you! As the host band, Mackville, we would like to express our greatest gratitude to venue host, The Great Pumpkin Patch, our sponsors, our MC, Jay Martin, our sound engineers, Dave and Jean Yount, past venues and sponsors, our fans, every band that has performed since our first festival in 2013, and all you bluegrass fans that attend. We feel you all have contributed to keeping this great big one-day festival to continue. We are now coming up on our six year festival. 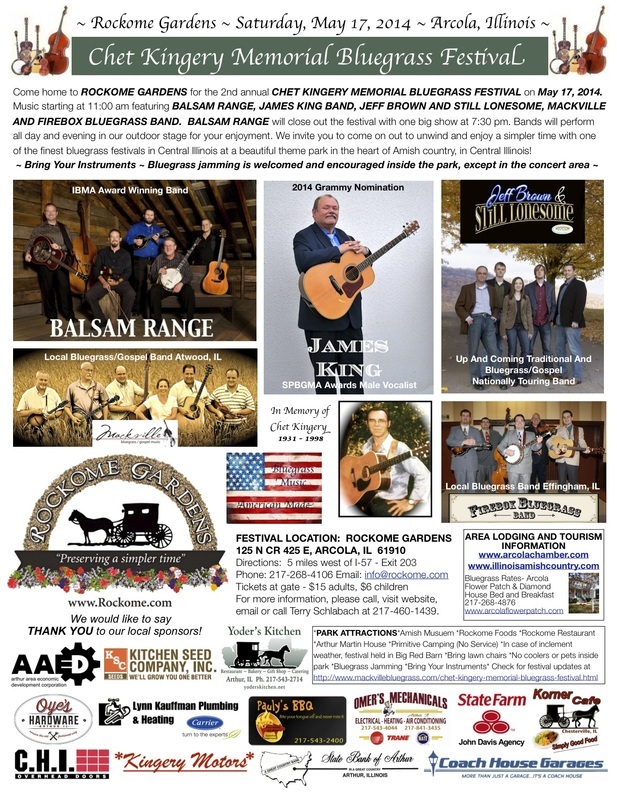 We are so excited to bring you the best of bluegrass to Central Illinois! A little town, Arthur, Illinois, is a small town, but big in heart. It is a fantastic town and countryside that takes you away from the hustle and bustle of every day life. You are only a stranger once. We hope you can come and spend the whole weekend with us here in the heart of Amish Country. There is a cheese festival in town all weekend as well as our bluegrass festival on Saturday. Below you can find out all about our local area with places to visit and stay while you are here and see for yourself what makes our area so special. We welcome you, and welcome you back! 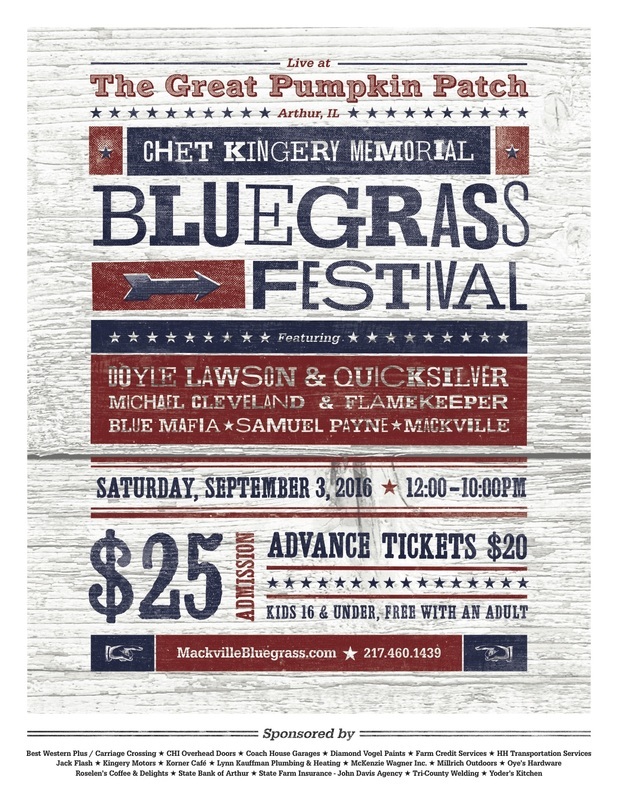 We are excited to bring you updates to the Chet Kingery Memorial Bluegrass Festival as well as our 2018 lineup! The date of the festival for 2018 will be Saturday, August 31st at the Great Pumpkin Patch, just south of Arthur, IL. We are eager to announce the lineup of Seldom Scene, Po' Ramblin' Boys, Art Stevenson and Highwater, Jack Shannon Band and host band, Mackville. For more information on the festival location, THE GREAT PUMPKIN PATCH, their website is: www.the200acres.com. For more information, please contact Mackville at 217-578-3868 or email us above. 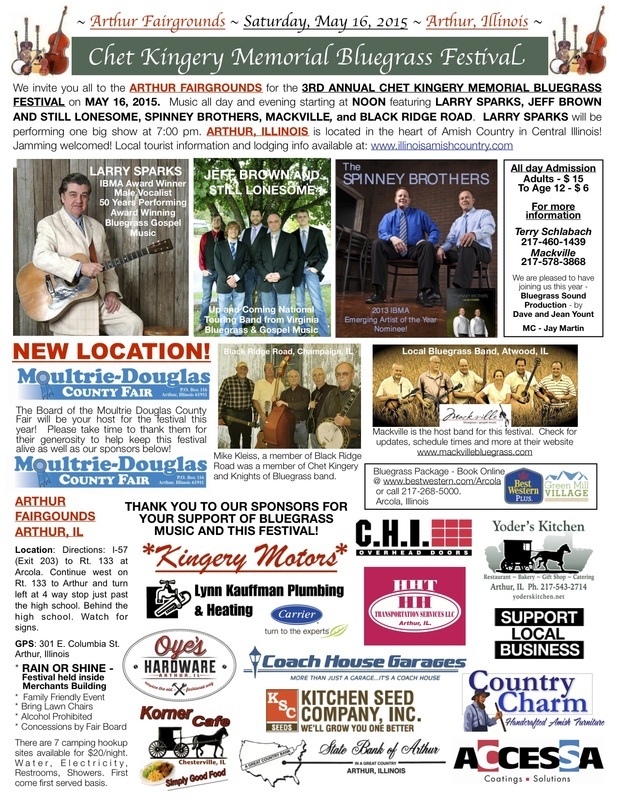 The first Chet Kingery Memorial Bluegrass Festival was held on May 18, 2013 at Rockome Gardens. It's name was deemed and honored in memory of a great local bluegrass musician, Chet Kingery, who passed away in 1998. Below are a few photos of Chet Kingery on guitar with his band, Chet Kingery and the Knights of Bluegrass. Our band, Mackville, is the host band for this festival. We are excited and proud to bring you this fantastic lineup of talent to this year's festival. Come and enjoy great music! We will be performing as well as the other bands listed below. We welcome SELDOM SCENE to our festival! Generations have listened and loved this group. Making a rare Illinois appearance, we are so excited to share their music with you. From their website: https://www.seldomscene.com, "The Seldom Scene is an American bluegrass band formed in 1971 in Bethesda, Maryland. The Scene has been instrumental in starting the progressive bluegrass movement as their shows include bluegrass versions of country music, rock, and even pop. What does it take for a bluegrass band to remain popular for more than four decades? For The Seldom Scene, it's taken not only talented musicians, a signature sound, and a solid repertoire, but also a sheer sense of fun." Members are Dudley Connell, Lou Reid, Ron Stewart, Fred Travers and Ronnie Simpkins. We welcome PO' RAMBLIN' BOYS to our festival! From their website: "At a time when most people feel constantly distracted by technology and barraged by the news, authenticity and straightforward honesty are paramount. There's something about the music of The Po' Ramblin' Boys that cuts right through the noise of the world and speaks plainly to the soul. Formed in the Smoky Mountains, The Po' Ramblin' Boys are at once exactly what you would expect and not at all what you would expect from a tattooed East Tennessee Bluegrass outfit. No strangers to hard work, the boys are as much at home riding in their 1965 GM Tour bus as they are crawling underneath to fix it when it needs maintenance. But they take pride in being ambassadors of their genre, and the group has brought their music from rural bluegrass festival stages to the rock clubs of Europe, with stunning results. "I think to a certain extent everyone is just craving music that they can feel, and any music that feels real will reach any audience" says CJ Lewandowski, the groups founder, "We want to put bluegrass right where it's least expected". Lewandowski was working at Ole Smoky Moonshine Distillery in Sevierville, TN when the band first formed. The distillery employed musicians to play for visitors seven days a week, and Lewandowski, who primarily plays Mandolin and sings, was occasionally hired to fill in when the entertainment didn't show. Eventually, the distillery approached him about forming a band for a full time slot, so he reached out to long time music friends Jereme Brown, who plays banjo for the group, and Josh Rinkel, who plays guitar. "Jereme was doing a lot of welding work at that time, and Josh was running a sign company", says Lewandowski, "I think we were all ready to do something new, something with our music but we didn't know when or how". Bassist Jasper Lorentzen happened to be working in the tasting room at the distillery, and he turned out to be the perfect final addition to the band. The four friends played multiple times a week for a year and half, honing their band sound, meanwhile word was spreading about their music. "The first gig we played out of town was a festival in Alberta, Canada, and a week later we went on a two week tour of Europe, it was crazy", says Lewandowski. Material for the group's debut album "Back To The Mountains", was a combination of original songs and old numbers that honor the group's mentors and bluegrass heroes. "We love to dig up old songs that haven't been heard in years and bring them back into the spotlight", explains Lewandowski. It's no surprise, then, that their latest single "Next Train South", is a song cut by one of Lewandowski's teachers from his native Missouri. "This song hasn't been recorded since 1974, when it was recorded by Dub Crouch, Norman Ford and the Bluegrass Rounders." he says. "Dub was a guy that I learned from back in the day. He was a close friend, and I was with him the day before he died. He was a popular guy for his region, but his music was not as well known on the national circuit. That's why we love to sing these songs, because when we take these songs and bring them to a larger audience, our heroes and their music will not be forgotten"
The Po' Ramblin' Boys passion for bluegrass is as clear as it is contagious. With a heavy touring schedule across the United States and Europe and recently signed record deal with the esteemed Rounder Records, the Boys are well on their way to becoming the quintessential bluegrass band of their generation. Despite all of their recent success, they maintain a humble perspective. "Bluegrass has left such a mark on us that we feel like we owe something back to the music", says Lewandowski. "We want to do somethingfor the music to show our appreciation... There's no telling what could have happened to us, what we would have become if we hadn't found this music. It's gotten us through a lot, the good and the bad. When I think about all of the damn medications that I didn't have to take because I had music to turn to. We didn't have to go to the doctor and pay for something to make us feel better, because we had this music, so we really want to honor it by bringing it out of the shadows and onto new stages and wider audiences. Because we know that if we can bring Bluegrass to new folks, those folks will come with us and support the bluegrass community." We are very excited to welcome ART STEVENSON & HIGHWATER! From their website at www.highwatermusic.com/, Art Stevenson & Highwater are Wisconsin's best-known bluegrass show, and has been in demand throughout the Midwest festival circuit since 1993. The band's bluegrass sound comes from the close duet singing of husband and wife team Art and Stephanie Stevenson, along with the spirited banjo and Dobro playing of Dale Reichert, and the hard-driving mandolin picking of Bruce King. They have release seven albums, Twilight, being the latest. High Water's music is heard on bluegrass radio programs around the USA and has received critical acclaim in the magazines Bluegrass Unlimited and Bluegrass Now. Recording artist James King and country music historian Bill Malone agree that Art and Stephanie Stevenson rank among the best duet singers active today. Art Stevenson & High Water's repertoire is taken from many sources: the bluegrass classics of Bill Monroe and the Stanley Brothers, early country music, mountain songs, and new material. Their blend of traditional bluegrass numbers, originals, contemporary songs, and instrumentals satisfies a wide range of music lovers! Art, Stephanie, and Dale have each written songs or instrumentals frequently performed by the band. The band's mission is to preserve the hard-driving traditional bluegrass sound, while including material from other musical styles. Art and Stephanie's singing, Dale's banjo instrumentals, Bruce's tasteful mandolin, and Art's harmonica tunes always bring a rousing response from the audience. Be sure to watch for Art Stevenson & High Water at a festival or venue near you! We are excited to bring you the talented singer and songwriter, Jack Shannon along with his group to our festival! Jack has lead our songwriters workshop at the festival for the past few years. From his website, jackshannonmusic.com/, Jack was raised in the Midwest to the sounds of Merle Haggard, Ray Price and Johnny Cash. He began playing guitar when he was only seven years of age. Then his older brothers introduced him to Bob Dylan and all the great 60’s rock music. In the 70’s it was singer songwriters that caught his attention. The most influential to Jack was the music of Jim Croce. For many years Jack has performed all styles of music which has influenced his own brand of songwriting. His songs will paint you a picture of happiness, pain or take you on a visit to times gone by. village of Arthur. Watch for signs! Our venue is The Great Pumpkin Patch, located just south and west of Arthur, Illinois! It is a perfect setting for an outdoor bluegrass festival. Nestled in the heart of Illinois Amish Country, this working farmstead contains over 200 acres where they raise pumpkins and other varieties of gourds and squash. The Great Pumpkin Patch hosts a bakery, a sweet shop, gift shops, stage area, food court, farm animals, pumpkin patch to pick pumpkins, maze, museum, haunted barn, wagon rides, numerous displays and many other fun activities with plenty of room to explore and enjoy outdoor country life and listen to the best of bluegrass and gospel music! There is plenty of parking and handicap parking is available. A huge tent will be available is there is a chance of rain. Please check out their website at http://the200acres.com for a full view of the wonderful time you will have in store at our new venue location! Please bring your lawn chairs and settle in for a wonderful day at The Great Pumpkin Patch! Best Western Plus Hotel Green Mill Village Hotel & Suites are one of our sponsors for 2018 and recommend staying here for a relaxing and cozy weekend! Phone: 217-268-5000 for reservations. Unfortunately, we have no camping on site at our festival. Here are links and phone numbers to camping information close to and in and around our area. Thank you! Arthur, Illinois - ﻿E.L. 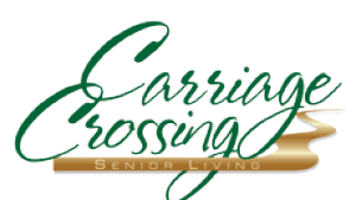 Jurgens Park﻿ - It is located behind the high school next to the pool and ball diamonds at the Moultrie Douglas County Fairgrounds, and is on a first come first served basis. We would like to say THANK YOU for your contribution to this festival! Without the support of these sponsors, this festival would not be possible. Please patronize these businesses or just say THANK YOU to them for their support and contribution. Look for their tent at our festival with instruments, accessories and more with special events planned throughout the festival! Locations in Effingham, Danville, Mattoon, Farina, Flora, Vandalia, Farmersville, Altamont, Arcola and our festival hometown in Arthur!